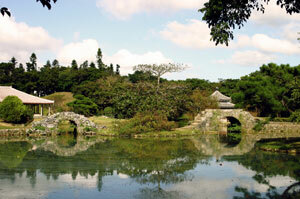 Okinawa island off the coast of Japan has a long and interesting history. Most people know it from it’s strategic role in World War II, but it is also famous for the Okinawa diet and Okinawan longevity which is the highest in the world on average! Although Okinawa, Ishigaki Island, and Miyako Okinawa are considered part of Japan, it is in a way very much separate and distinct from the main island. The pace of life is slower, and the Okinawan people do enjoy a very real sense of community, where daily life strikes a healthy balance. It is hard to believe that the birthplace of Karate is such a peaceful and serene place, where people live very much in harmony with their surroundings. The frenzied pace of life in places like Tokyo do not intrude into life on Okinawa island. The island is a beautiful and idyllic place, which lends itself to a serene and peaceful lifestyle, but Okinawan longevity is largely a result of lifestyle choices and practices of its native people. Even the hotels in Okinawa are noted for their decor use of green plants and flowers creating a natural and relaxed atmosphere. The practice of martial arts, prevalent among Okinawans, is geared more to exercise than fighting or self-defense. It is this vigorous but gentle exercise, coupled with a healthy diet, which is responsible for their long and active life spans, largely free of stress. 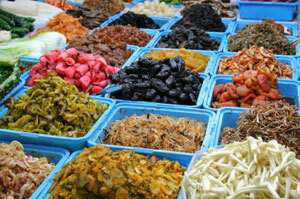 You may be surprised to find that Okinawans eat more animal proteins than their cousins on the main island of Japan. They consume a diet consisting mainly of fruits, vegetables, soy, grains, seaweeds, fish, and some pork. What they don’t consume is fast foods laden with trans-fats and refined sugars. It is quite accurate to say that they get much of their nutrition from the sea, and are rewarded by the highest per capita longevity in the world! Their consumption is much less than ours calorie wise, but more nutrient dense due to the unprocessed nature of the foods in the Okinawa diet. The incidence of heart disease on Okinawa is extremely low, and there is also a very low incidence of cancer. Consumption of fish rich in Omega-3 is one of the keys to Okinawan longevity, and is transferable to our society as well. For hundreds of years the martial arts have been the source of both physical exercise and spiritual development for the people on Okinawa island. The popular conception of deadly fighting arts belies the reality of health benefits from the practice of Karate, and other martial art forms. It is often hard for Westerners to understand the way the physical, emotional, and spiritual are embedded in these ancient practices. Where they once served as defense against hostile invaders, they are now one of the cornerstones of the Okinawan lifestyle. From all observations and research that have been done on these people, it remains clear that Okinawan longevity is a result of the Okinawa diet, a balanced and unhurried lifestyle, and exercise, which is integrated into their daily routine. This combination makes life on Okinawa island long, active, and happy.